Dr Adrian Johnston chairman of the International Fund for Ireland at a Peace wall interface on Springfield Road, Belfast. 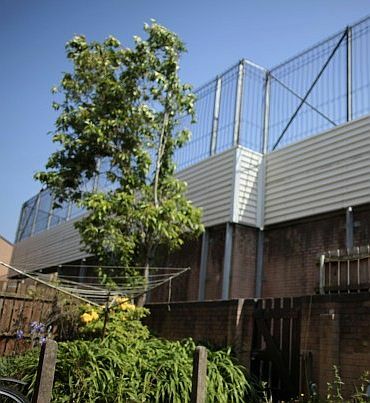 Government plans to tear down all of Northern Ireland’s peace walls within 10 years are ambitious, according to an organisation that has worked with interface communities for the past year. 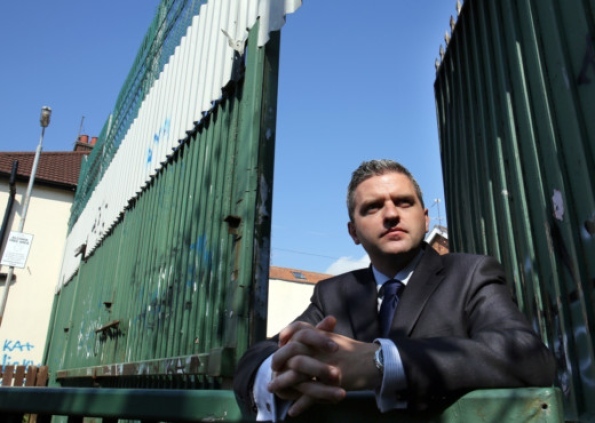 The International Fund for Ireland which has been running a peace walls programme for 12 months said it would not have put a deadline on re-building confidence and addressing security issues. “Interface walls can only be removed when the time is right and that time will be determined by the communities themselves,” said Dr Adrian Johnston chairman of the International Fund for Ireland. Northern Ireland’s peace lines are a mixture of traditional walls, fences and gates. 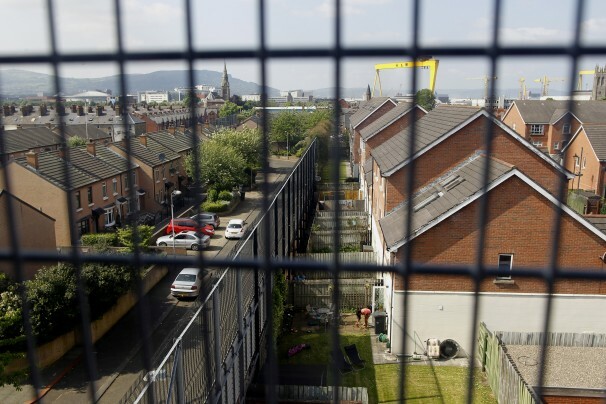 They have been built in areas of sectarian tension in Belfast, Derry and Portadown, as well as through the playground of a primary school in north Belfast. Some tower up to 18ft high (5.5 metres) and may be miles long through areas of dense housing. They were intended to be temporary and protect people from violence during the 30-year conflict but remain 15 years after the Good Friday Agreement which ended the Troubles. Peace walls have increased in number and scale since the 1994 ceasefires with an estimated 80 currently in existence. Dr Johnston said a number of communities had requested assistance to positively transform their areas but deep seated problems still need to be addressed. “The International Fund for Ireland can bring communities to the point where they feel it is safe to remove the peace walls. There are elements of security there - the Department of Justice, the PSNI and the communities have to make that decision themselves. Therefore the International Fund for Ireland would not put a timeline on how long it should be before interface walls come down. “I think it is ambitious and you do have to have ambitions. One of the things we have to look at is challenging communities to progress. But, change has to be managed very sensitively,” he added. The International Fund for Ireland was established in 1986 to promote economic and social advance, encourage dialogue and reconciliation between unionists and nationalists. The peace walls project has been included as part of its new three-year strategy to tackle segregation and promote reconciliation and integration in interface areas. The overall cost of division in 2001 cost Northern Ireland around £1 billion including the provision of segregated social housing and single identity schools. The strategy also includes a peace impact programme to help “hard to reach areas” suffering from high levels of economic and social deprivation where there are low levels of engagement with statutory agencies and where the peace process has not delivered. Dr Johnston said: “As peace building has evolved, so too have the challenges and much work is still needed to address prevailing sectarian tensions. “The community transformation strategy recognises the new reality on the ground and looks to support communities that are still affected by the threat of violence. It is particularly focused on addressing the root causes of sectarianism and, in some cases, is making the first effort to tackle very difficult and sensitive issues. Last month the First and Deputy First Ministers unveiled their Shared Future Strategy which includes the target of bringing down all of Northern Ireland’s peace walls by 2023. Another project is to establish a ‘’united youth programme’’ in which 10,000 people aged between 16 and 24 who are not in education, employment or training would be given a one-year placement with a stipend. An all-party group with an independent chairman is to be established to deal with contentious issues like flags.